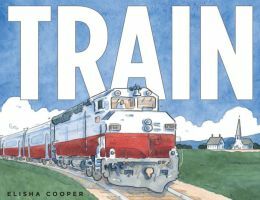 While this realistic fiction picture book reads like a nonfiction book, the illustrator does admit that the train station in San Francisco picture in the book is entirely fictional. Tickets are purchased and passengers race to catch the train. The paintings are beautiful and realistic. Any child who has ridden a train will love revisiting the experience and those who have not will be daydreaming about it until they do. All the buttons and gauges the engineer sees and touches are in the illustration as well as the beautiful countryside that they are driving through. True life announcements are made on the intercom system as factories, cities and other trains go whooshing on by. All different kinds of container cars are pictured and explained, but not overly explained. Readers are still left to wonder what might be in each ones as it flies on by. Then the train is chugging through the Rocky Mountains with all of its wonderful eagles, moose and deer outside. The overnight train has a fancy dining car and a sleeping car with fold-out seats that turn into beds for comfy sleeping while the train continues through the mountains. Second grade readers and third grade readers will enjoy reading this book of sparse text and detailed pictures over and over as they study the pictures and feel the excitement of the trip. Literacy skills of every kind can be practiced in this story as well as core curriculum geography by providing a map for children to mark while reading about the trains travels. It would also work extremely well in a transportation unit as a read aloud for kindergarten or first grade readers.